Held: Murray Henderson Collection, Glenside Progressive Assn. Inc. The following article was sourced, with permission, from the writings of Murray Henderson, descendant. The May and Henderson family of Peterhead, Scotland immigrated to New Zealand in 1886 and settled at The Halfway, now Glenside. They called their 65 acre farm Glenugie, after the River Ugie and Ugie valley near Peterhead. John May was the fourth child of nine children from the union of John May and Jane Stephen of Inverallochy, Scotland. His father was an industrious and capable fisherman. In 1838 the family moved to Burnhaven, a small close-knit fishing village not far from Peterhead, Scotland. At the time John was about ten years old. In a few years he would become a competent fisherman and would also extend his skills by taking up trade as a cooper, - a barrel and cask maker. Janet was the youngest of six children to George Milne and Janet Williamson who lived on a farm four miles west of Peterhead and to the south of the River Ugie in Scotland. On 2 June 1856 the couple were married at the farm, Hillhead of Cocklaw, near Peterhead. For the next 30 years Janet and John lived in and near Peterhead. Their family bible records that Janet May gave birth to thirteen children. At the time of their marriage John May was a skilled cooper and fish-curer. He set up his own business in Peterhead. He also had a small farm holding on the outskirts of town and Janet kept a little shop nearby where her younger daughters helped her when necessary. John and Janet May’s eldest daughter Mary-Jane was the first of their family to marry. Her husband was Captain John Henderson and they married at Peterhead on 27 April 1881. For reasons unknown John and Janet May and their immediate family, including son-in-law Captain John Henderson and infant son John, left their home in Peterhead and travelled to London where in late January 1886 they boarded the Shaw Savill & Albion Company steamer Ionic and departed for the long voyage to New Zealand. John Seaborn Henderson aged 3. It would seem that no firm plans had been made about just where the family were to settle in New Zealand. Their first home was in a rented house in Parnell where they stayed for several weeks. A move was then made to Christchurch and then soon after to Blenheim. Whilst there, their daughter Eliza Jane, a qualified teacher, secured a position at the Renwicktown School and taught there for some time. Finally the opportunity came for the Mays to establish themselves with some permanency. On 30th July 1886 John May purchased a small farm of 65 acres just north of Johnsonville in an area then known as the Halfway. 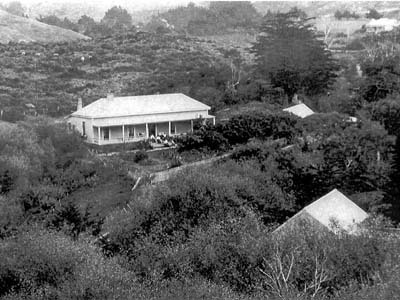 This property was part of the original Section 24 on the Porirua Road and was brought from Charles Pichoir de Launay who had recently built a house there. With obvious nostalgic reference to their homeland the farm was named Glenugie after the river and valley near Peterhead that had so greatly influenced the lives of their ancestors for several centuries. Subsequent family recollections seem to confirm the fact that this was not easy land to farm and that great effort was needed to make it reasonably productive. But at least they owned it and a period of consolidation followed. Probably in the late 1880’s John May with his son John Alexander May as a worthy assistant, built premises on the shorefront at Paremata and started an operation which comprised a cooperage and smoking and curing facilities. They employed local fishermen to provide the catch and very quickly they became firmly established. They were soon joined by Thomson Bruce, a skilled fisherman, who had worked for John May back in Peterhead and who would later marry his daughter Barbara. Their business was known as J. May and Co.
As the family settled down to life in New Zealand each member became involved in other pursuits and interests. In the absence of the Congregational Church in the area, John and Janet became loyal and respected members of the Johnsonville Wesleyan Methodist Church and remained so for the rest of their lives. After some fourteen years yet another move was contemplated and effected soon after. John May sold the Glenugie farm to John Collings Moxham on 29th September 1900 and purchased a block of land in the heart of Johnsonville – bounded by the lower end of Trafalger Street and Railway Terrace (now Frankmore Avenue). This section was only metres away from the site on the banks of the Waitohi Stream where in 1841 settler Frank Johnson built a house on his 100 acre Section 11 on the Porirua Road. When they took up residence in Johnsonville, John and Janet May began a period of relatively quiet retirement. John apparently never became involved in public life but both of them maintained their reputations as very respected and popular members of the community. John and Janet May celebrated their Golden Wedding at Johnsonville in 1906. John May died on 30 August 1907 aged 78 and Janet May died two years later on 17 July 1909 aged 73. Both are buried in the Wesleyan Methodist Church Cemetery in the heart of Johnsonville. 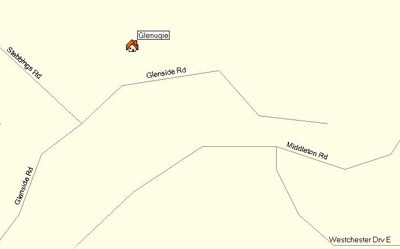 The Glenugie Farm was bought by the Moxham family, followed by the Hodge family and the Pender family. The Pender's sold to the Wrightson company, and the homestead was subsequently pulled down in about 1979. The homestead block was separated from the main farm by the Westchester link road and is named "Waitakaro". The Reedy family own this land and the main farm, which is on the north side of the Westchester link road. “Few if any in the area will now remember John and Janet May, their family and the Glenugie farm. However to us descendents the attractive little Glen will remain a tangible, lasting local reminder of long ago and the lands of the Ugie on the other side of the world from whence it gained its name.” The words of descendant Murray Henderson (1928 - 2008) in the book From Glen to Glen. 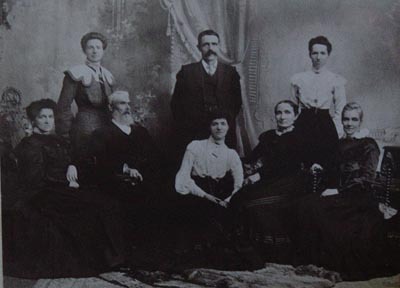 Captain John Henderson 1852-1924 His ancestors and descendants. Privately published family history.